Just outside the museum in your way to the exit, you will find a big statue standing over a fancy Art deco sarcophagus, surrounded by a semi-circular memorial topped by busts of men. That's the tomb of French archeologist Auguste Mariette Pasha "1821-1881". 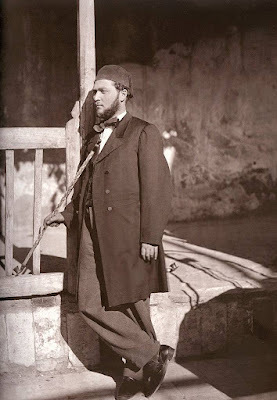 Frenchman August Mariette was the first curator of the first true Egyptian Museum in Egypt as well the founder of Egypt's first official Egyptian department of Antiquities aka the Supreme council of antiquities aka the Current ministry of antiquities. 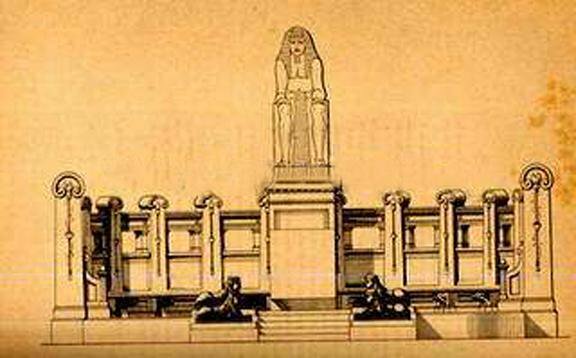 The big irony is that Mariette Pasha was not the founder of the Egyptian Museum in its current location but he was the founder of the true Museum dedicated to Egyptian antiquities under the supervision of the Egyptian department of antiquities. 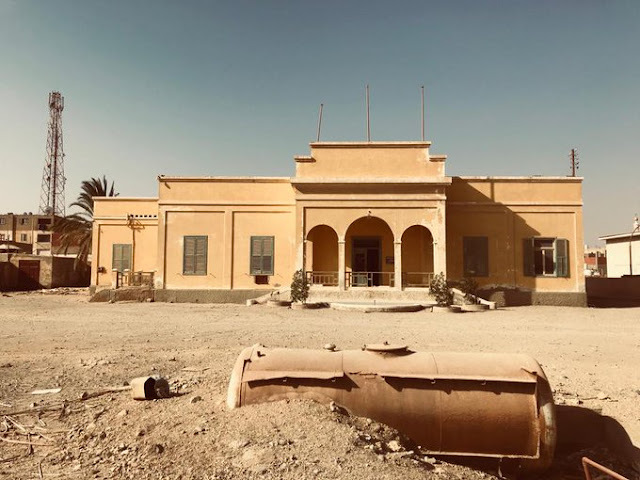 Historically, the first Museum dedicated to the Egyptian antiquities was founded in 1835 during the rule of Mohamed Ali Pasha. 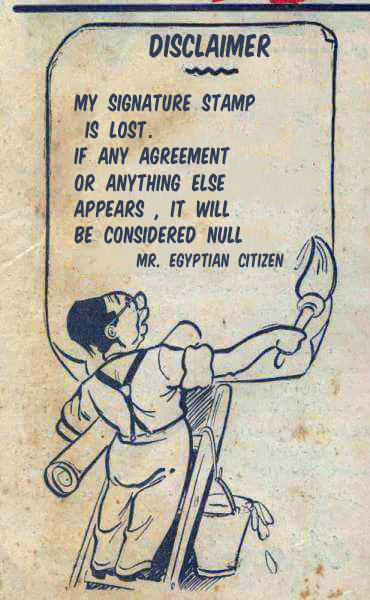 It was built near the Ezbekeyah gardens in Cairo. Later, it was moved to the Citadel. 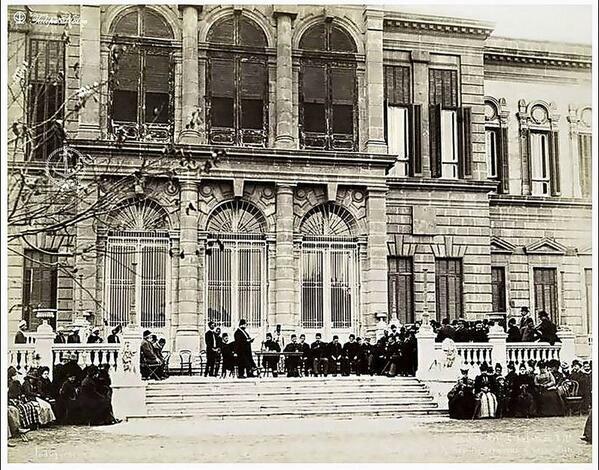 In 1855, Khedive Saeed decided to give the whole collection of that museum to the Austrian Emperor of Mexico "yes, you read it right" Maximilian I. 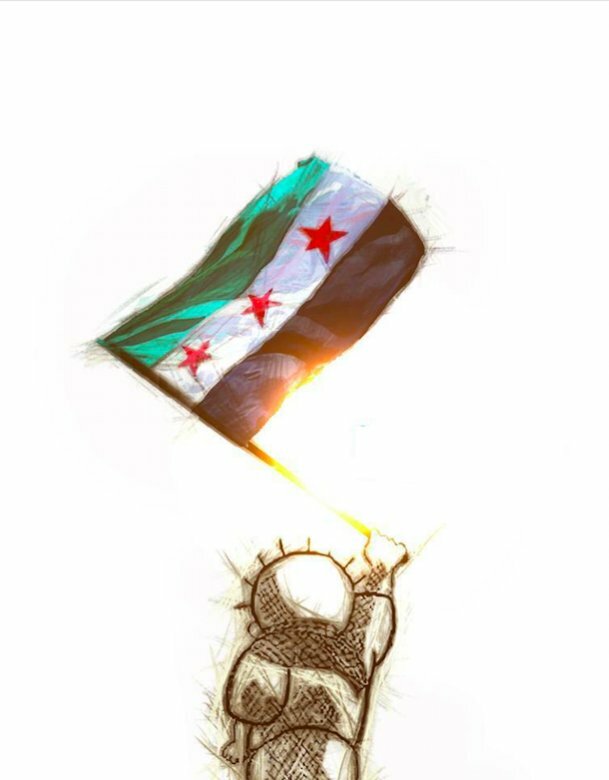 Already, Saeed sent Egyptian troops to fight with the French against the Mexican revolution during then. Now the whole Egyptian collection of that first museum is at Kunsthistorisches Museum in Vienna, Austria. In 1858, under the supervision of French Egyptologist Auguste Mariette and with the support of Khedive Ismail, the Egyptian Museum in Cairo was founded in Boulaq area on the banks of the Nile In 1878, that Museum drowned in a flood of the River Nile. 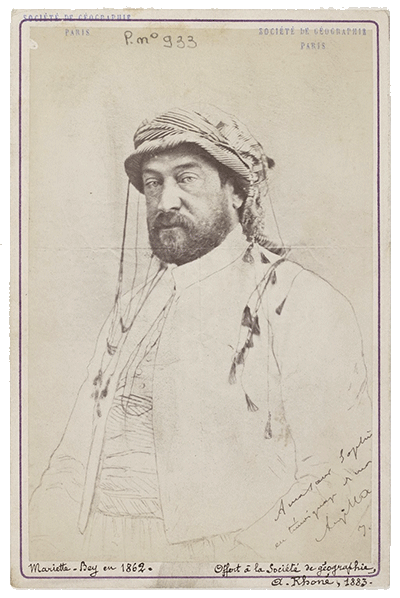 Not only Egyptian antiquities drowned by the flood but also Mariette Pasha's notes and drawings drowned too. Mariette Pasha and his work were significant in the Egyptian archeology whether in Egypt or Sudan. Before his death in 1881, Mariette made sure his countryman Gaston Maspero would replace him as the head of the Egyptian department of antiquities. He also demanded to be buried in the garden of the museum in a fancy sarcophagus like the Ancient Egyptian kings whom he dedicated his life to studying. He got his wish after his death. Mariette Pasha was buried in the garden of the Boulaq Museum. Mariette Pasha's tomb at Boulaq Museum "Facebook"
The Egyptian department of antiquities also made a statue of him to commemorate him in the most ancient Egyptian way I would say. 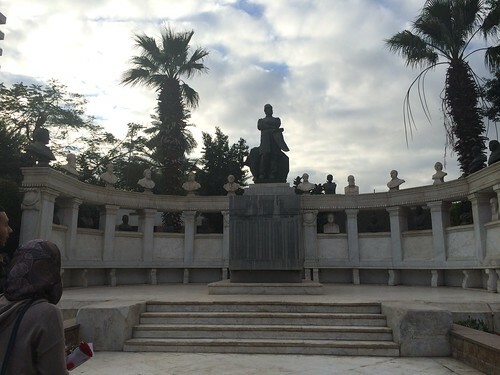 The statue was made and put in Boulaq Museum. 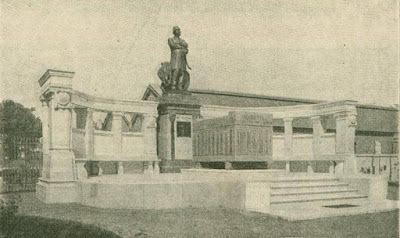 The inauguration of the statue at Boulaq museum "Facebook"
In 1891, after Mariette's death by two years, the remaining collection of the Egyptian Museum drowned in the flood was moved to a former Royal Palace in Giza aka Giza Palace. 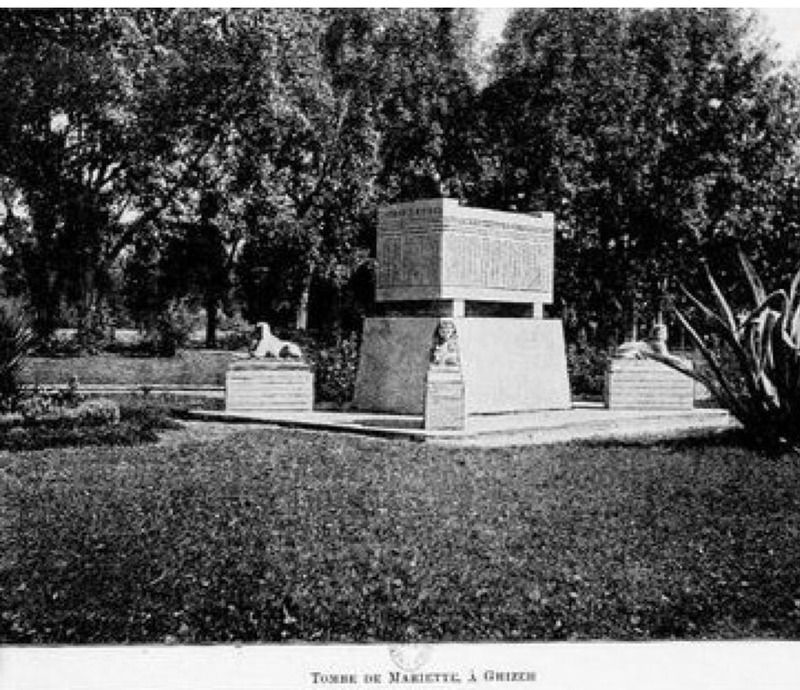 The remaining collection did not move alone because August Mariette's tomb moved with it and he was buried at Giza Museum. The tomb of Mariette Pasha in Giza Museum. 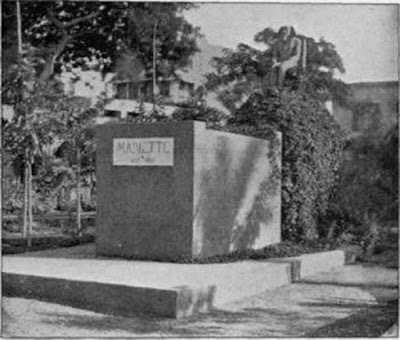 As a sign of gratitude by Maspero, Mariette's tomb was moved to the new location. The new tomb was more sophisticated than just an art deco sarcophagus especially the statue of the pioneer Egyptologist was placed over the tomb. The original design was more ancient-Egyptian influenced. 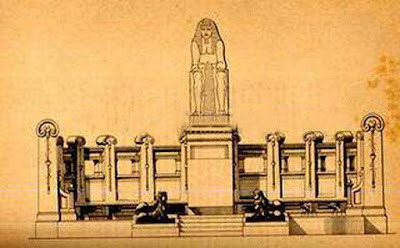 The original design of the memorial "@So2rate"
Later, the busts of famous Egyptologists as well famous museum curators were placed on the semi-circular memorial around the sarcophagus. 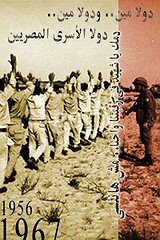 No doubt that Egyptians owe a lot to both Mariette Pasha and Maspero. Next time when you go to the Egyptian Museum in Cairo, do not forget to visit Mariette Pasha's tomb before you leave.